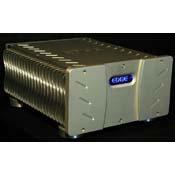 Offers the tube lover a no-hassle alternative for a power amplifier. Very sweet sounding with warm mids and highs, excellent low frequency extension and control. Soundstage is neutral, doesn't present a forward, in-your-face presentation. Runs very cool, even after a couple hours the heat sinks are cool to the touch. Very highly recommended (if you can find one on the used market). Front display is not too bright and overall looks really nice. Power, sound, ease of use, nice feel. This is an amplifier that may not seem exciting at first, but it will stay in your system for a very, very long time. It is the non-exciting products that really bring out the music, and that is exactly what the NL12 does. It is the only SS amplifier that I have heard that has the tonal and harmonic qualities that allow it to properly and meaningfully play classical music (really the only genre I and my system do). It is completely bullet-proof, no fuss, really sweet sounding and feeling amp. The level of sophistication that this amplifier will add to your system is very impressive. Nice job Edge! It has never had any problems, but I have heard that the Edge people are really nice.